This week’s episode coincides with Earth Day, fittingly symbolic for the Slow Flowers Movement and flower farmers, floral designers and product innovators who are working to change our industry and push for progress to alter the status quo. So I’d like to share a few news items as well as two follow-up interviews featuring guests of past Slow Flowers Podcast episodes. Listen closely to find out how you can win prize packages from each of our guests – you’ll want to get in on the good stuff! First off, if you enjoyed last week’s interview with Jenny Elliott and Luke Franco of Tiny Hearts Farm in New York’s Hudson Valley and Rachel Gordon of Taproot Flowers of Brooklyn, please check out more photos that I’ve added to the show notes. They’re onto something really special and I encourage you to listen if you missed that episode – and enjoy the beautiful flowers the three of them grow and arrange in their worlds. Second, I want to share details about this week’s Fashion Revolution Day, which takes place on April 24th. If you believe in Slow Flowers, you should also embrace and support Slow Fashion, which has so many parallels in terms of labor practices, environmental concern and trade policy. Slow Fashion asks questions about the origins of the clothing we wear that are virtually identical to the questions Slow Flowers asks about the bouquets we bring into our homes. Fashion Revolution Day 2015 marks the second anniversary of the Rana Plaza disaster in Dhaka, Bangladesh, which killed 1,133, and injured over 2,500 people. According to Fashion Revolution’s data, one in six people work in the global fashion supply chain. It is the most labor-dependent industry on the planet, yet the people who make our clothing are hidden from us, often at their own expense, a symptom of the broken links across the fashion industry. Wow, doesn’t that sound identical to the floriculture industry? On April 24th, coordinated teams around the world will challenge global fashion brands to demonstrate commitment to transparency across the length of the value chain, from farmers to factory workers, brands to buyers and consumers. 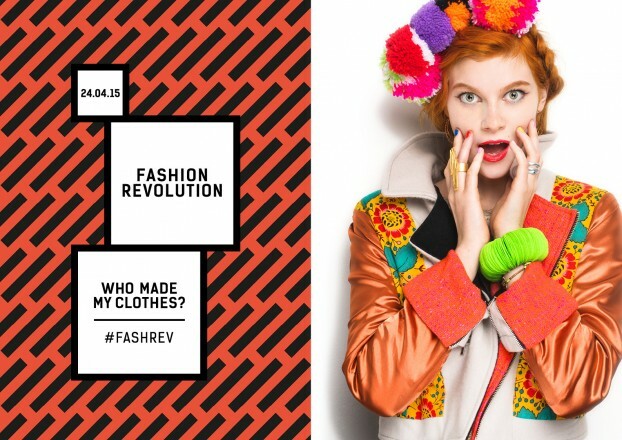 Zady.com, an innovative online fashion brand based in New York City, is serving as U.S. chair of Fashion Revolution Day. Slow Flowers has been invited to help promote the cause. Check out this Slow Fashion/Fashion Revolution event taking place in Brooklyn. Slow Flowers hopes to have ongoing involvement with Slow Fashion in the future. I am inspired by what the fashion industry has done in just two years to mobilize conscious consumers to care about the origins of their clothing — and in the future, I hope the floral industry will be just as vocal. I don’t wish for a fatal disaster to occur at an unregulated flower farm in a distant land to make us all wake up and start asking about the origins of our flowers. What you can do on April 24th is to use your own social channels to get active. Take a photo of yourself wearing an item of clothing inside out. Tag the brand, share the photo on Facebook, Twitter and Instagram with the hashtags: #whomademyclothes and #fashrev. Not to take away from this important endeavor, but perhaps you’ll be inspired to ALSO take a photo of yourself holding flowers that came from a US mega-retailer, big box store or supermarket and tag that retailer on your social sites with the hashtags: #whogrewmyflowers and #slowflowers. Just a thought. 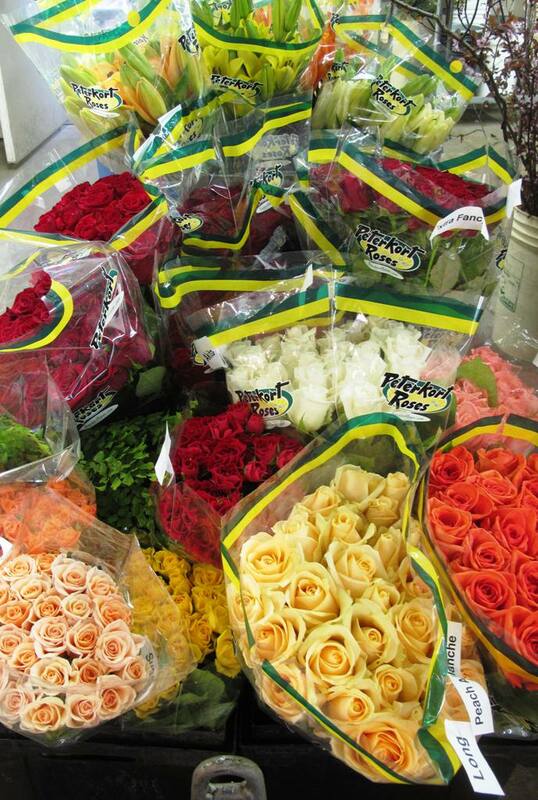 Oregon-grown roses from Peterkort – healthy, sustainably grown and simply beautiful! Our first guest today is Sandra Peterkort Laubenthal of Peterkort Roses in Hillsborough, Oregon. Located outside Portland, the Peterkort name is synonymous with high quality roses and other crops like lilies, freesia, maidenhair fern, ranunculus, anemones and cymbidiums grown for florists and designers in the Pacific Northwest and beyond. Sandra and her brother Norman Peterkort run the third-generation family farm. I devoted a chapter to them in The 50 Mile Bouquet, in which are featured some fabulous photographs taken by David Perry. And I designed with many of their lovely flowers in the Slow Flowers book. Inside one of the rose-growing greenhouses at Peterkort Roses (pre-fire). I’ve so enjoyed getting to know Sandra and Norman over the years during visits to their farm. There’s nothing like walking amid row after row of American grown roses to change your view of the delicate and fragrant flower. Peterkort’s flowers are grown with heart and soul – and their hybrid teas, sprays and garden roses are some of the most valued crops sold at the Seattle Wholesale Growers Market, and the Oregon Flower Growers Market in Portland. So, when a fire swept through several of Peterkort’s greenhouses on December 23, 2014, the news shocked and saddened our floral industry here and across the U.S. We don’t have many locally-grown flower crops to satisfy demand during the winter months, but here in the Pacific Northwest, Peterkort has been the go-to source for roses and lilies year ’round. 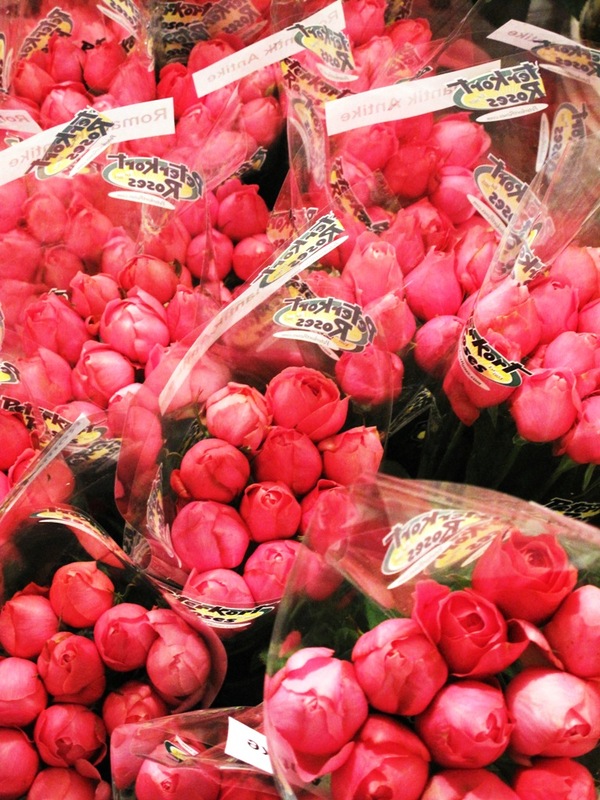 Needless to say, I want to congratulate and celebrate with the Peterkort family and share the good news that Peterkort Roses are back in business – just in time for Mother’s Day. More Peterkort pretties! Post a comment below and you might win a bunch! If you’d like to win a huge bunch of Oregon grown roses, shipped to you from Peterkort in time for Mother’s Day, be sure to post a comment below naming your favorite Peterkort rose variety. 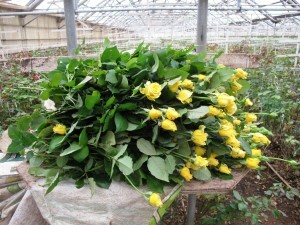 You’ll have to visit the Peterkort Roses web site and peruse the gallery of more than 40 varieties. All entries (comments) are due before the random drawing, which will take place at 5 p.m. on Sunday, April 26th. We can’t promise the winner the variety he or she names, due to limited quantities, but I will work with Sandra to choose a beautiful bunch for the winner we draw. The winning entry must be shipped to an address in one of the 50 U.S. states. Mickey Blake, inventor of Floral Soil. Our second guest is Mickey Blake, founder and CEO of Floral Soil LLC, based in Everett, Washington. The first-ever media interview Mickey gave about Floral Soil aired here on the Slow Flowers Podcast on September 24, 2014. Since then, there has been considerable interest from all sectors — florists, consumers, retailers, wholesalers – and of course, competitors – who want to get their hands on this game-changing product called Floral Soil. What is it? Floral Soil is a 100% plant-based, 100% compostable, nontoxic product that replaces the conventional chemical-based, non compostable floral foam that has been the industry standard for 60 years. According to Mickey, with so much riding on this transformational product, the pressure has been huge to get it right. And for a small business with just a handful of employees and grassroots funding, time can’t move quickly enough. I have observed people asking questions and expressing frustration about Floral Soil’s launch on social media. I know many of the answers, because Mickey is here in my backyard and we’ve had many personal conversations about what she’s doing to speed up that launch. I asked her to return to the Slow Flowers Podcast to update everyone with the news that Floral Soil’s production facility is scaled up and ready to launch just in time for Earth Day. 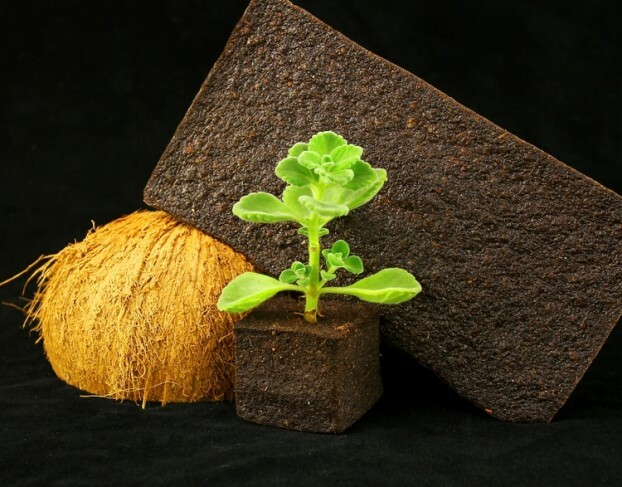 It really does look like rich, healthy soil – and it stablizes stems for floral arrangements (and actually serves as a growing medium for live plants) without poisoning the planet. We’re giving away one 20-pack case of full-sized Floral Soil bricks, courtesy of Slowflowers.com. To enter, post a comment on the show notes below, listing the one action you plan on taking in your own floral practices to honor Earth Day. All entries are due before the random drawing, which will take place at 5 p.m. on Sunday, April 26th. The winning entry must be shipped to an address in one of the 50 U.S. states and will be shipped by the end of May. Good luck! 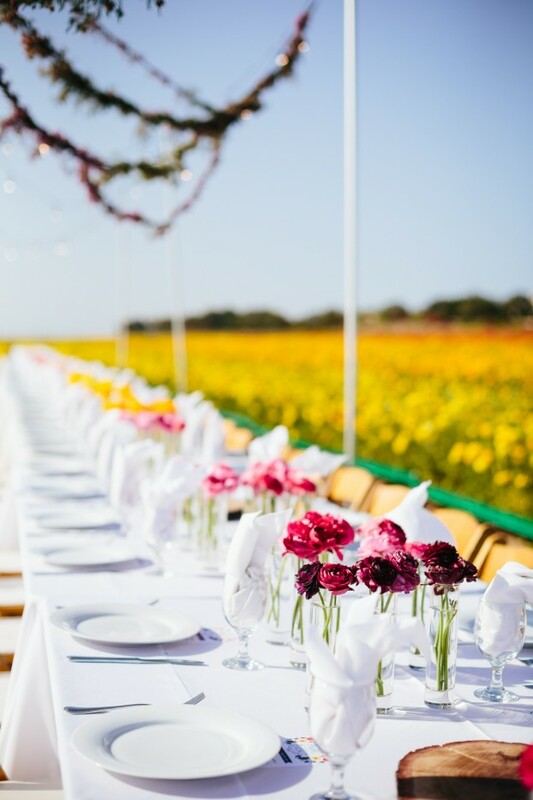 The table was set – in the midst of The Flower Fields! This lovely moment was captured by photographer Jodee Debes and used here with her permission. If you’ve been following Slow Flowers involvement as a co-host of the Field to Vase Dinner Tour, I have to take one moment to thank everyone who made last week’s dinner such a huge success. 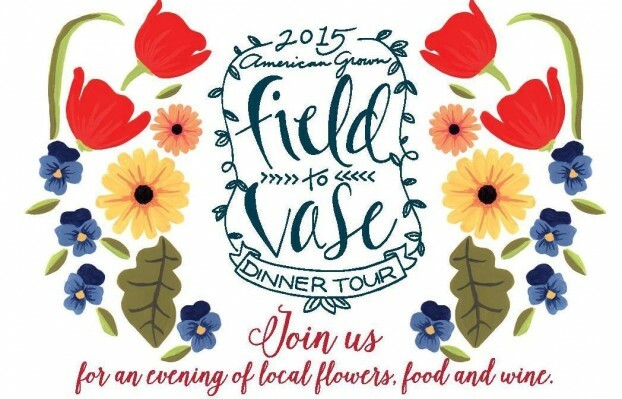 The purpose of the Field to Vase Dinner Tour is to shine the light on American grown flowers, elevating the flowers on our table alongside the food on our plate and the wine in our glass. 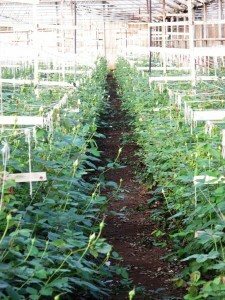 People who want to know where their food comes from are now inspired to ask: where did my flowers come from? who grew them? how were they grown? 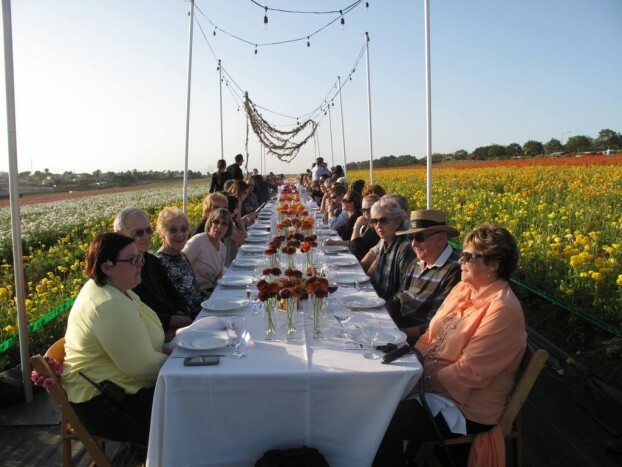 Last week, 115 people gathered around the table in the heart of The Flower Fields in Carlsbad, California, surrounded by acres and acres of beautiful ranunculus. The land is owned by the Ecke Family (famed for modernizing and popularizing the US poinsettia) and it is farmed by the Mellano Family, for generations, California flower farmers. Bess Wyrick of Celadon and Celery designed the florals and relied on the creativity of many volunteers from Slowflowers.com to pull it off in such a short time frame. And a special thanks to my friend and colleague Kathleen Williford, who is the special events manager for the Field to Vase Dinner Tour. She is superhuman in what she can pull off with limited time and resources! 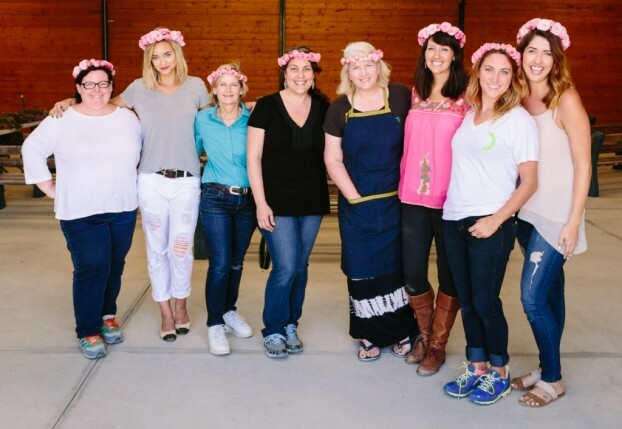 Floral Design team, from left: Kathleen Williford, Liz Cherk, Bonnie Manion, Jen Macy, Debra Prinzing, Christa Lipinski, Bess Wyrick and Jodee Debes (c) Jodee Debes. The next Field to Vase Dinner will take place on June 19th at California Pajarosa Floral in Watsonville, California – an American rose farm. 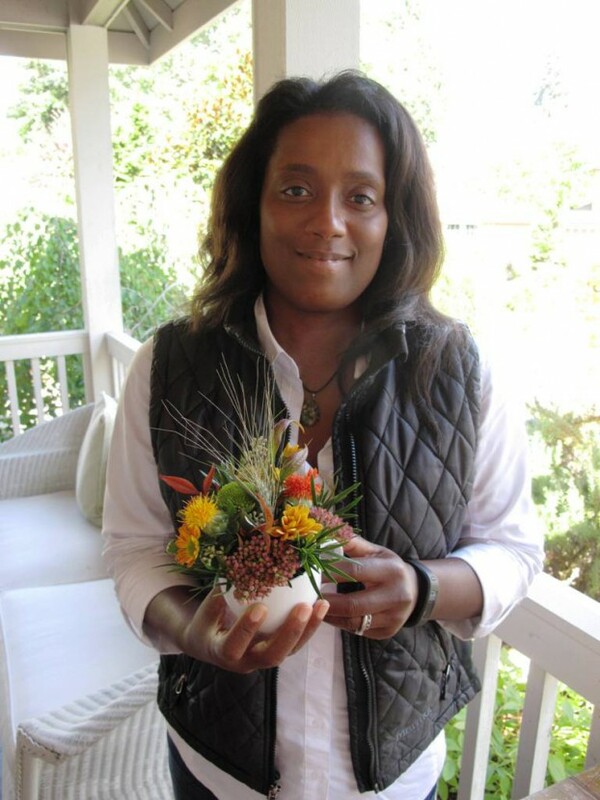 Teresa Sabankaya of Bonnie Doon Garden Co., a recent guest of this podcast, is the featured designer and I know her florals will be local, seasonal and special! 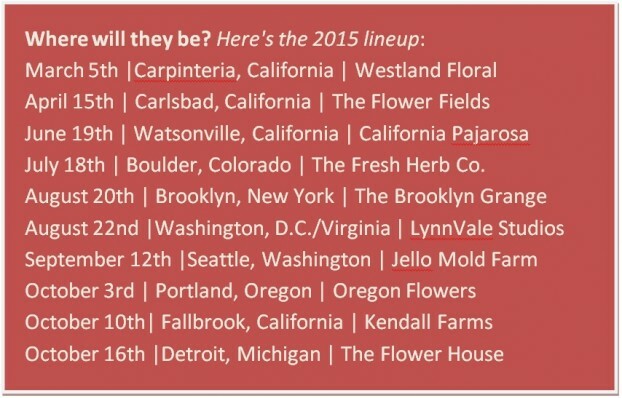 It is going to be a fabulous year for promoting American grown flowers. Click here to reserve your seat! Listeners like you have downloaded the podcast more than 45,000 times. Until next week please join me in putting more American grown flowers on the table, one vase at a time. And If you like what you hear, please consider logging onto Itunes and posting a listener review. This entry was posted on Wednesday, April 22nd, 2015 at 6:01 am	and is filed under American Grown, Blog Posts, Creativity, Entertainment, floral design, Flower Farming, General, Plants, Podcast Episodes, SLOW FLOWERS Podcast, Slowflowers.com the Directory of American Flowers. You can follow any responses to this entry through the RSS 2.0 feed. You can leave a response, or trackback from your own site. I LOVE the Naranga roses Peterkort grows. Those orange beauties will always be my go to rose. Amazing podcast! Thanks for your work! I like Sonia, such a pretty salmon color and holds well. Thanks! I am in love with the Maria Theresa garden roses; breathtaking!! I can’t wait to try out the Floral Soil. Love seeing your photos of the Carlsbad Field to Vase tour, Debra!